This isn’t really a recipe, but rather an idea. 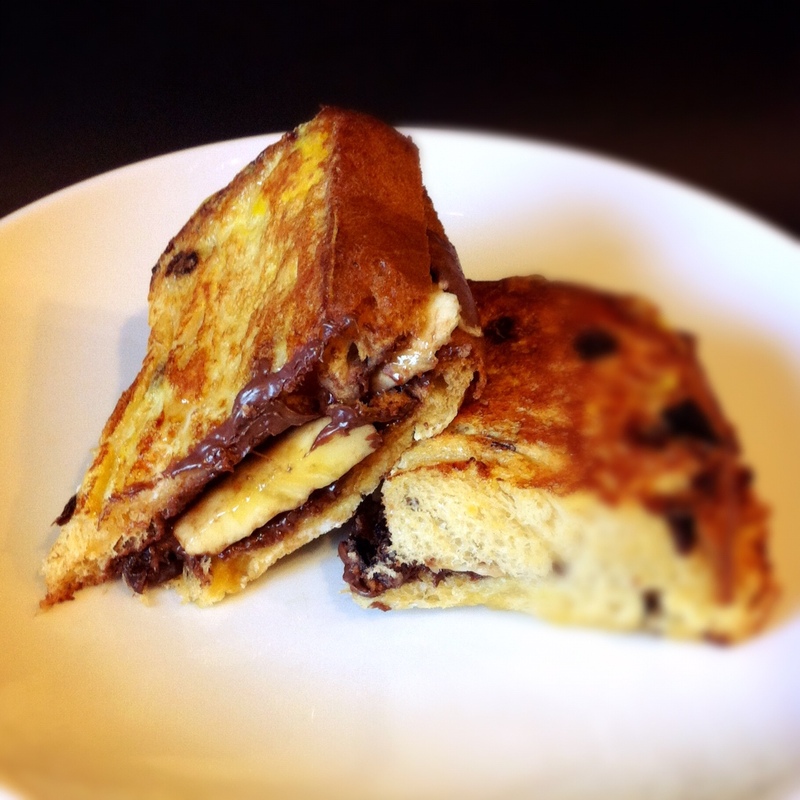 Everyone knows how to make French toast, right? I love Panettone (the one from Whole Foods is especially good) and every Christmas morning I make Panettone French toast for my family. The other morning I was feeling festively creative (I guess I couldn’t wait until Christmas) and whipped up this little Nutella-stuffed gem. I posted a picture of it on Instagram and people went insane, so I decided to share it with you. It’ll definitely be making a repeat appearance on Christmas morning. Happy holidays, everyone. Enjoy yourselves and each other. 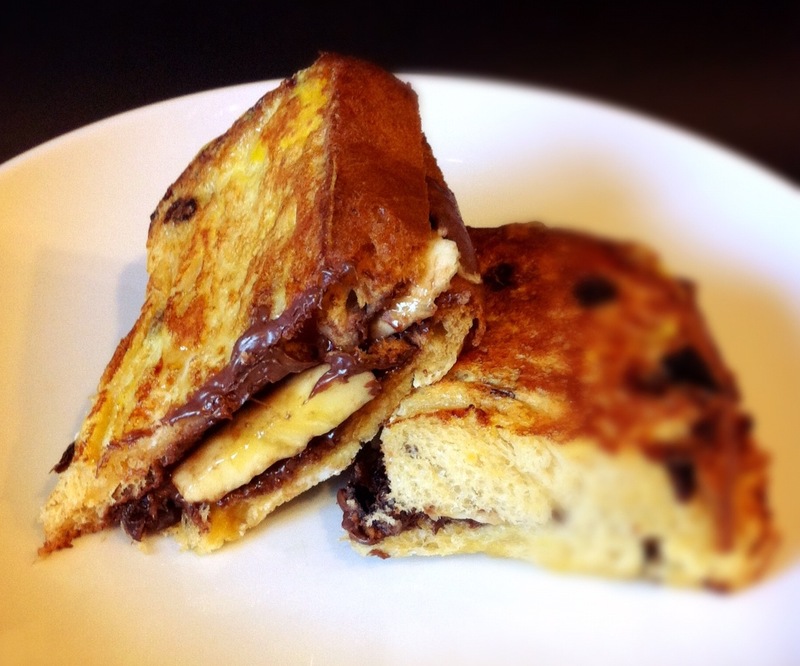 Make sandwiches by slathering as much Nutella and banana as you want between two slices of panettone. Set aside. Create a custard by mixing eggs, a splash of milk and a pinch of cinnamon together in a shallow bowl that’s large enough for dunking. Preheat a skillet over medium-high heat, and dunk each sandwich in the custard just before adding to the skillet. Cook for approximately 2 or 3 minutes on each side or until golden brown. Top with real maple syrup. OMG…salivating! looks so good Bobbi! Jason just subtly hinted that he wants me to make this for Christmas breakfast. I am happy to have found a good foodie blog to read! Yum! I have a loaf of panettone waiting to be eaten but my boyfriend and I don’t enjoy eating it plain. I was going to making bread pudding with it but I think I’ll have to try french toast with it too! Wow. That looks evil in all the best ways. Top it with some fresh strawberries and it’s like getting to eat a banana split for breakfast.